Tashi Norbu is an independent -Tibetan born- contemporary Artist with the Belgian citizenship who lives and works in the town of Emmen, The Netherland. Tashi is educated as a traditional Tibetan Thangka Painter and he worked in Dharamsala, India. He completed his art studies in the west at the Saint Lucas Academy of Visual Arts in Ghent, Belgium. The Art of Tashi Norbu shows the fundamentals/basics of his background -Tibet and Buddhism- combined with strong influences from western Art forms, western ideas and modern time icons. 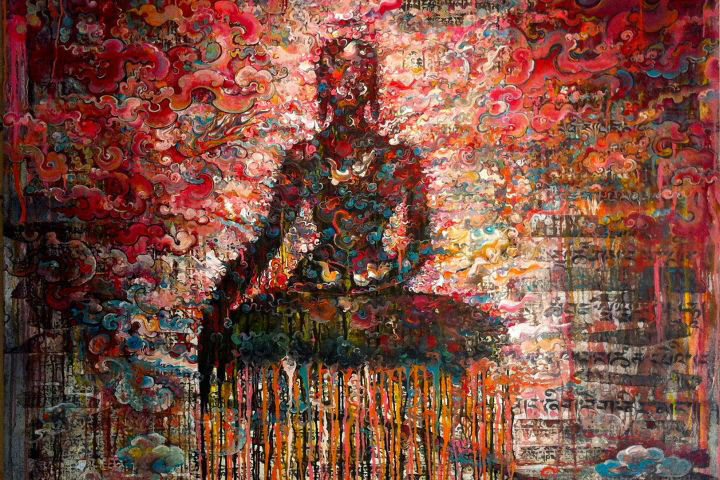 Nowadays he is considered as a visual Artist giving live painting performances around the world along with Tibetan rituals establishing “The Tibetan Mantra Lounge” accompanying him during his Live Painting. 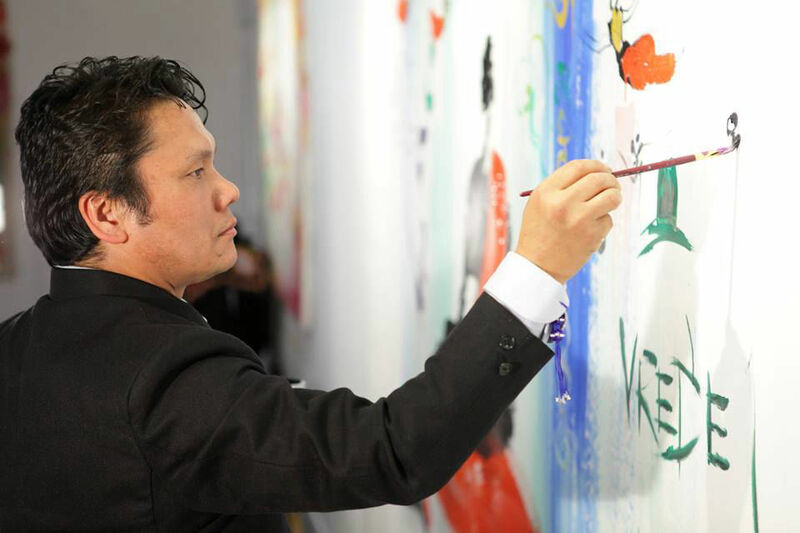 Tashi Norbu is also the Chief Executive Director at Museum of Contemporary Tibetan Art in the town of Emmen, The Netherland. There on 1st June 2017 he established the Museum of Contemporary Tibetan Art under the support of the Municipality of Emmen. The Museum is officially included in the list of the Museum of the Netherlands. Tibetan mantra lounge - jamming and meditating for love and world peace from the Museum of Contemporary Tibetan Art Emmen, the Netherlands. 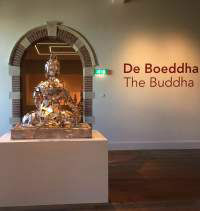 2016 Sep 22 : Tashi Norbu celebrates the successful installation of the Silver Buddha at the National Museum (Tropen) in The Netherlands, Amsterdam, as the e-mail sent by museum's coordinator says: " ... the opening of the exhibition went exceedingly well yesterday, not least due to the marvellous presence of Be the Flower, Not the Bee." Tashi Norbu sends messages across the Globe about environmental awareness with his sculptures. The Artist’s “Urban Buddha” Sculptures are Artworks which send message to the world, that is now more important than ever. Four Sculptures which not only practice what they preach, but they are social works in the sense of peace, benevolent acts, expanding cultural awareness through Art. A way for the Artist to draw attention to environmental awareness across the globe. 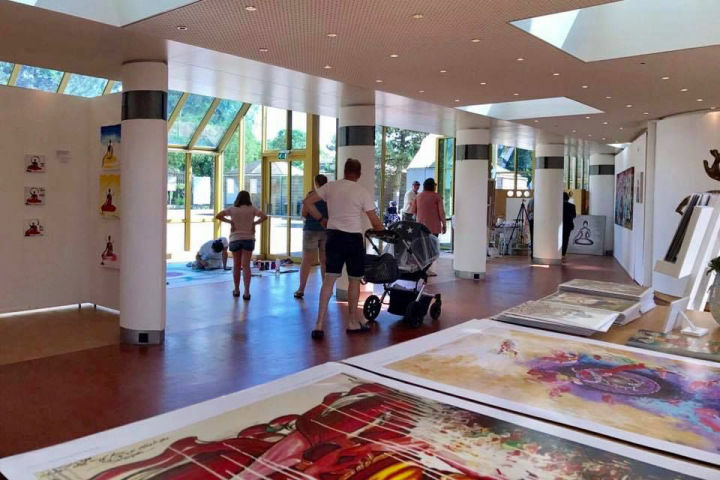 The artworks are created in different countries, collaboratively by locals. Symbolizing in this way Artist’s aim, nations and people to be coming together in order to work for a better future. 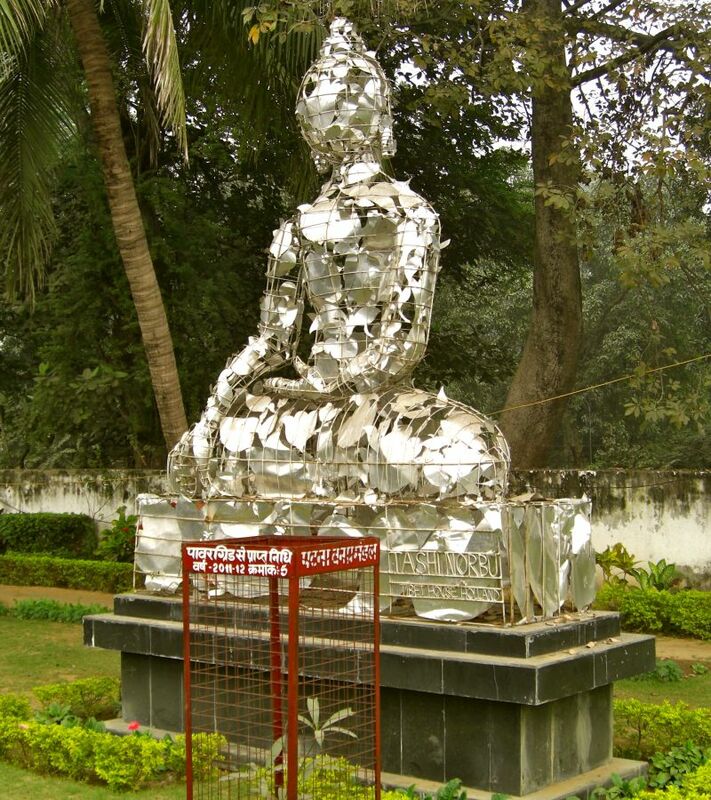 Bodghaya/Bihar India, Urban Buddha 2011 made out of waste iron 6x5 m. The statue belongs to the collection of Bihar State and the Gandhi Museum. It is made out of waste iron, welded iron rods, aluminum sheets and iron threads of 5x6 m sending a message of recycling metals so that we may preserve natural resources, requiring less energy, emitting less carbon dioxide and other harmful gasses in our life. 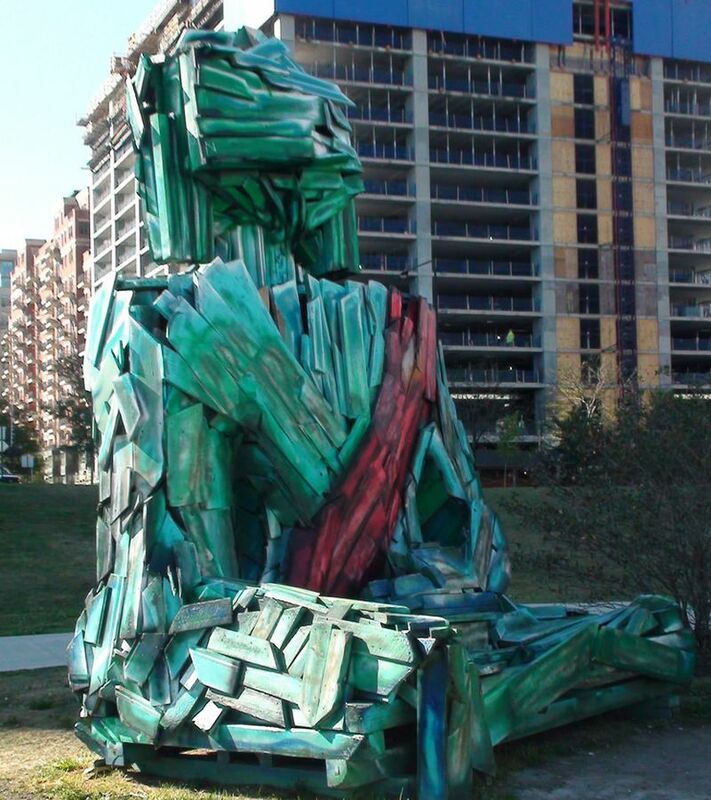 Chicago/Grand Park U.S. Urban Buddha 2016 made out of recycled wood 6x5 m. It is comprised of about 3,500 pounds of reclaimed/recycled wood. It sends a message about the rampant made of recycled wood and makes a statement about deforestation such as from palm oil production, or the cattle ranching in the Amazon rainforest. This sculpture 6x5m is painted in bright turquois and red and was inscribed with Buddhist mantras. 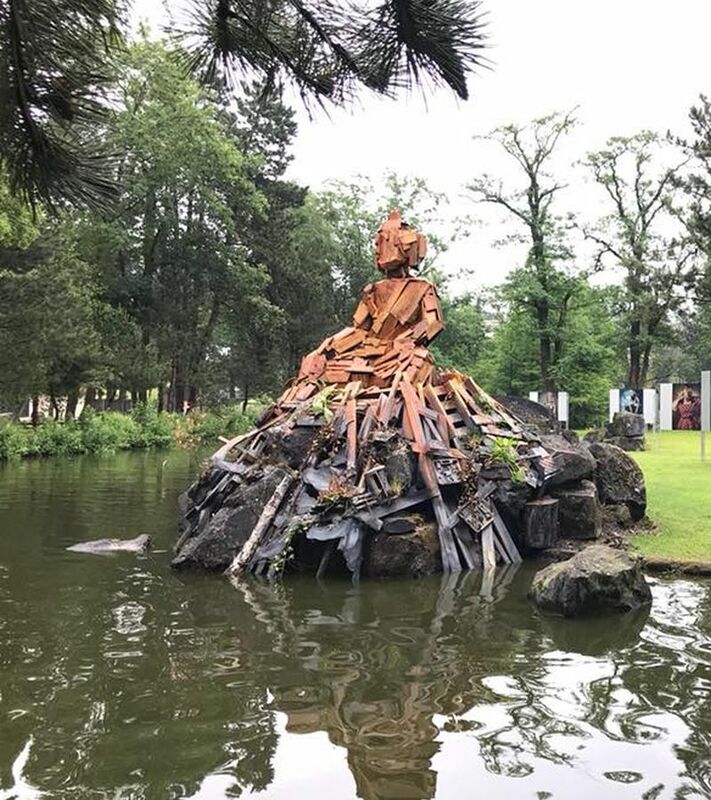 Emmen/Rensenpark the Netherlands Urban Buddha 2018 made out or reclaimed wood 4x4 m. The Artist participated in this way in the project “Emmen goes Eco”. A Sculpture made of reclaimed wood, and wasted objects. It is situated in a peaceful environment among the nature, thus symbolizing peace and tranquility. It raises awareness of ecology and global warming, happening nowadays, around the world. A message about harmful environmental issues. 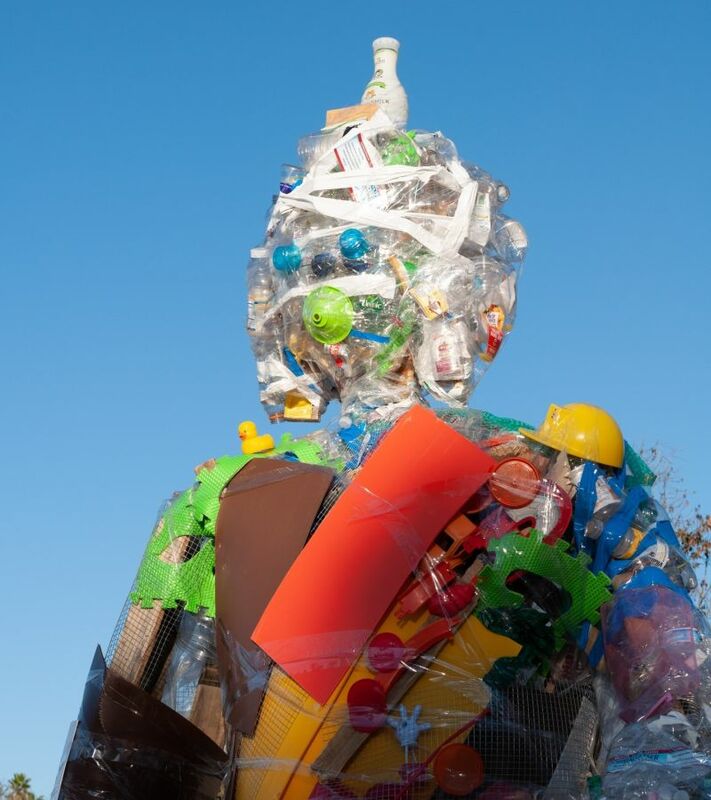 Encinitas,Sandiego/California Urban Buddha 2018 A Sculpture 3x4 m., entirely of plastic waste, reclaimed from the ocean. The locals and all, call it “plastic soup”. It is created using all kind of plastic collected from the Pacific. It is a message and physical example of why it is necessary to change and learn about the use and dispose of plastic in the world of today. It is a reminder that all plastic thrown, eventually find their own way into the environment. A great ad from the University of Wyoming Art Museum where the Artist showed the many forms of his Art; showing appreciation on Tashi's Artistic activities, suggesting the Tibetan Art and Culture as a unique expression of Art in the world. This advertisement will be in the university magazine which goes out to Donors and Alumni. 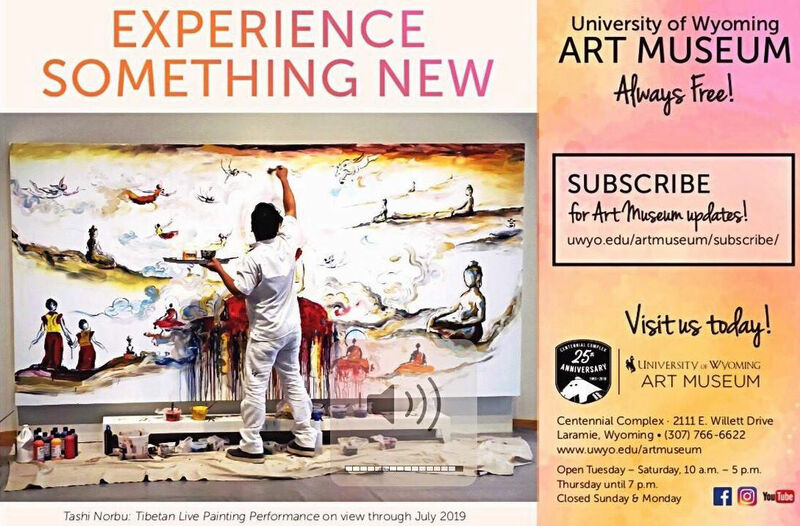 Tashi Norbu’s Art created during his live painting performance is now exposed at the Wyoming Art Museum through July 2019. It will be included at the permanent Art collection of the Museum. The Art of Tashi Norbu shows the fundamentals/basics of his background -Tibet and Buddhism- combined with strong influences from western Art forms, western ideas and modern time icons.